I am a little ashamed to admit that I have been neglecting my iPad 3, a lot, over recent months. I got an iPad mini on its launch day morning last November and it quickly won me over with its wonderful lightness and form factor. Like others, I was initially skeptical about the 8 inch (or near enough) tablet form factor, but after just a day or so with the iPad mini I was a big fan of it. All these months later, I still am and it’s easily my most used device. I’d say my usage pattern on tablets recently has been around 60% iPad mini, 30% Samsung Galaxy Note 8, and only 10% iPad 3. This past Monday I wanted to get a multi-screen setup going while taking in Apple’s WWDC 2013 keynote event. I decided to view Apple’s live stream on the iPad, follow the Engadget liveblog in Chrome on my iMac and use Evernote on the iMac to take quick notes during the event. The iPad 3 screen was the obvious bigger, better choice for watching the Apple live stream. It also served as an instant reminder of how fabulous the iPad 3’s Retina display is, and of just how much I’d been neglecting my big friend. — I need to strive towards a better workflow between my various sized devices – from the 5.5 inch Galaxy Note 2 thought the 8 inch and 10 inch iPads and the 21 inch iMac on my desk. Typing that sentence makes it feel like that’s a whole lot of thinking. — If, as expected, a new iPad mini later this year has a Retina display it’s going to be damn near to a perfect device. How many of you are multiple iPad / tablet owners? What’s your usage pattern like between your devices? I dunno. I love the iPad 3 so much, I couldn’t see any benefit to the iPad Mini. Especially because I’m of that certain age where my vision isn’t what it was in the ’60’s, so every little bit of extra screen space is appreciated. I was blown away by the Retina Display as well, so downgrading the resolution for the Mini wasn’t something I wanted to do. As a matter of fact, before the Mini came out I assumed that most people were like me, in that they loved the larger sized screen. I was very surprised to find out how wrong I was. The Mini has obviously sold extremely well. But with all that being said, and assuming that if the iPad Mini with Retina Display, and iPad 5 come out at the same time this fall, I’d still prefer the iPad 5. Gotta love 10 inches. Between my four main devices, the iPad 4, nexus 7, iPhone 4S and galaxy note 2. I find I use the nexus 7 the most and like you it’s because of size convenience. My only bug bare with the Nexus is the lack of rear facing camera, but with a decent camera on my iPhone and note 2 that short coming can almost be tolerated. The iPad 4 is a recent addition to my tech arsenal (as recent as this week in fact) and already it is having uses, especially at home, but I do find it cumbersome compared with the Nexus 7. Every bit of tech has its place and all are important but the nexus comes out top for everyday use. I purchased an iPad 3 at launch, loved it. Thought I needed an iPad mini at launch, waited a few months and caved in. I really appreciated its size and ergonomics. Used it for a good three months. Meanwhile, iPad 3 was being used by my wife. One day I was looking at pictures of our new baby, looked not too bad on iPad mini. Took a look at the same picture on iPad 3 and my mind was blown. The colours, the sharpness of it all. I immediately swapped iPads with my wife. We are now both happier with our devices. She can chuck the mini in her purse. 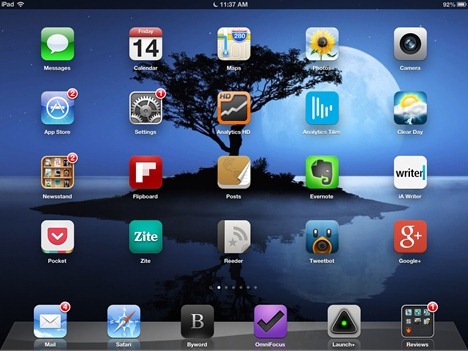 Edit: 99% for iPad 3, 62% for mini. I know what you mean. I had the first iPad. I never bought the second one as it came out only 8 months after I bought the first one. I didn’t buy the iPad 1 right away. But when I got my iPad 3, like you said, my mind was blown as the sharpness of the resolution and the vibrancy of the colours. And for me, I need the larger screen size ’cause my eyes aren’t what they used to be. And if the iPad 5 comes out this year to be a bit lighter….so much the better.